Warehouse Boat Storage Facility Highland: Looking for the best boat storage warehouse facility in the Highland area? Looking for the best boat storage warehouse facility in the Highland area? A primary concern for boat owners is where to store their unit. In the Redlands area, local ordinances prohibit parking boats along street side parking and most Southern California boats do not fit inside residential garages. That’s why many boat owners look to a self storage facility. 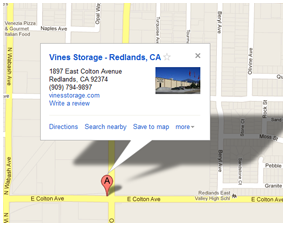 Vine Storage in Redlands can accommodate all makes of boats and personal water craft with their easily accessible facilities off East Colton Avenue. At Vines Storage, we offer indoor or outdoor storage for your boat. Outdoor boat storage comes with options that are less costly than indoor climate controlled or indoor racked storage. Cost savings is the chief reason boat owners select outdoor storage, in addition to added efficiency in accessing the boat for parking and when hitching up to take the boat off of the storage lot. As a bonus with Vines Storage, we offer a mix of outdoor storage space sizes so you can securely lodge your boat and other personal belongings including related watercraft items or rent adjacent double lots to park your boat and RV all in one place. Vines Storage provides 32-camera, 24-hour surveillance video cameras. Our amenities allow customers to rinse salt and sand from their boat when they return it to our facility, and asphalt or concrete surfaces and ample unit space makes it convenient for boat owners to perform routine maintenance or have repairs done quickly and easily. If you do select outdoor boat storage, remember to weatherize your boat properly when storing it for the off-season to protect it from the rain, sun, and dust. Use a cover or tarp – a wise investment that pays off to extend the life of your boat’s hull, flooring, and upholstery. There are pros and cons to outdoor boat storage. Make the choice that is best for you. Should you change your mind, at Vines Storage it is as simple as changing the type of storage you are renting, without having to move your boat off of our lot. Call (909)389-6209 today to get rates and term info for outdoor storage for your boat.